Foam is one of the most widely utilized materials for relieving discomfort, able to to reduce pressure, soften uncomfortable hard surfaces and give vital support to the body. With the variety of foam materials and the versatility of each type, foam can be customized to fit the needs of any individual. One kind of foam that is particularly beneficial for providing customized comfort and relief is eggcrate or convoluted foam. The Foam Factory offers this product in almost every open-cell foam variety they stock, along with customization options that let you individualize the product to your needs. 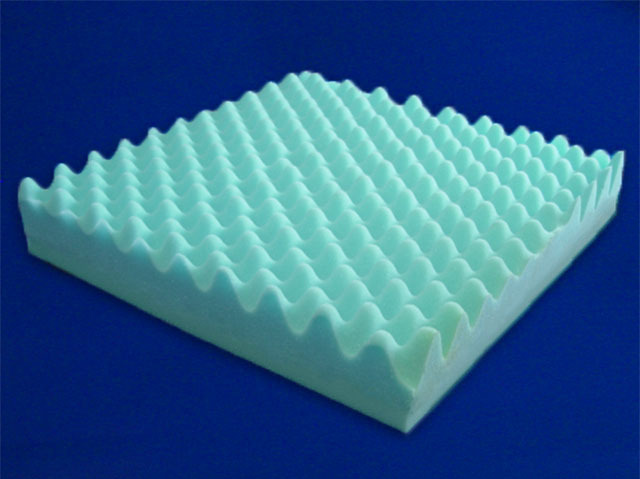 With its peak-and-valley design and range of uses as foam packing, casing and comfort materials, eggcrate foam is a product that is immediately recognized, no matter how it is used. But even with as many people who know what it is, very few individuals understand why it is such a beneficial and practical material. While its design is what makes it so recognizable, it’s the peaks-and-valleys of eggcrate foam that also make the product cost-effective and useful. Manufactured by running a standard sheet of foam through a machine called a convoluter, the material is compressed by a studded roller that creates alternating levels of pressure across the foam as a blade passes through the material. Cutting through the foam while undergoing patterned compression is what generates the eggcrate design. That process also produces two sheets of eggcrate foam from what was once one solid sheet. The ability to manufacture two eggcrate products out of a single sheet of uncut foam, with only one pass through the machine, minimizes the labor and maximizes material, which means savings for customers. While very cost-effective, eggcrate also touts physiological and comfort benefits. For someone in need of the softest, most cushioning and pressure relieving material, eggcrate is perfect. When cut from the same bulk form, an eggcrate cushion will be softer than its solid counterpart by virtue of its design and reduced mass. 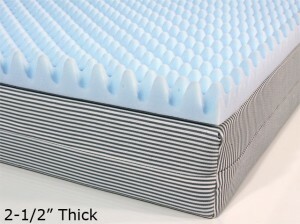 With the valleys causing less foam to be in contact with the body, eggcrate has a softer feel than a solid sheet of foam. This generates excellent pressure relief and softness qualities, while the solid base of the cut still provides support. The peak-and-valley design also permits more airflow than a flat sheet would, keeping the user cooler. These qualities translate to superb custom mattress toppers, seat pads, wheelchair cushions and pet beds. Due to the comfort they can provide at an excellent price, mattress toppers have become one of the most popular uses for eggcrate material, and with a topper from The Foam Factory, there are many customization choices at your disposal. Because eggcrate is made through a manufacturing process and is not created as a raw foam material, any non-bonded open-cell foam products can be cut into the eggcrate pattern, including specialty foam products filter foam and Dryfast foam. This also means eggcrate toppers can be made from any of The Foam Factory’s more traditional foam varieties, with super soft foam for the plushest topper, firm foam for comfortable support, or cost-effective poly foam for occasional use products. In addition to choice of material, toppers can be cut to any bed size, be it standard or even a one-of-a-kind size. And while most typically manufactured in 1-1/2 and 2-1/2 inch peak varieties, eggcrate can be made from 1 inch in total height up to 4 inches. These options make an eggcrate mattress pad from The Foam Factory the right choice for everyday comfort at home, on the road for truck drivers, and a smart product to bring along when camping as well. Another traditional use for an eggcrate pad is as a seating cushion. Eggcrate foam can make a huge difference in the daily lives of people, whether they spend all day at a desk, on the road, or require the assistance of a wheelchair for mobility. One of the most surefire ways to be uncomfortable while sitting is pressure. When a seat doesn’t offer enough soft cushion or comfort, pressure points can be created where the body weight is targeted. This reduces circulation, which can cause issues from legs falling asleep all the way to serious bed sores for those in wheelchairs for extended periods of time. Adding an eggcrate cushion or wheelchair seat cushions can provide softness that reduces or eliminates unpleasant pressure points, improving circulation and increasing comfort. As with their mattress toppers, The Foam Factory offers a broad selection of chair pad and cushion products to increase the comfort in your life. Because the greatest amount of body weight is targeted at the seat while sitting, The Foam Factory only manufactures their single-piece eggcrate comfort foam cushions from Lux firm foam to withstand the load. Other, less supportive materials could be used, but depending on the situation, the material may not be strong enough to prevent bottoming out. However, hybrid cushions are often made, where thin sheets of eggcrate are adhered to a solid base of firm foam that will properly support the body while providing custom comfort and cushion. These pads can be cut to virtually any dimensions and are available as foam-only forms or covered with a selection of materials, from a non-removable gray and white striped cover, to zippered micro-fiber suede or twill in multiple vibrant colors. The comfort and coziness of eggcrate foam isn’t restricted to only humans either. In addition to their comfort and support products, The Foam Factory also has a line of pet products, which includes an eggcrate foam pet bed. Foam cushioning benefits animals just as well as humans, and these beds can help relieve pressure and soften hard surfaces for your pet. Eggcrate foam pet bedding is particularly useful for animals recovering from surgery or pets that are starting to get older. A custom eggcrate bed can give your pet better sleep, reducing their stiffness and soreness, while giving them more energy through the day. Available in many different sizes, from the smallest 16 by 22 inch bed up to the 60 by 72 inch bed, there’s an option that’s perfect for your pet. Pet beds also come with covering options just like the seating cushions, with non-removable gray and white striped covers and zippered micro-fiber suede or twill covers in a variety of colors to match your home decor. While many useful products are made out of eggcrate, it can also be added to many products for improvement in comfort. Pillows can be wrapped in thin sheets of eggcrate to provide a soft surface on top of a firm and supportive, ergonomic form, while body wedges and leg pillows with flat surfaces can also have eggcrate adhered to them, without sacrificing the support of the cushion’s base material. Even round body bolsters can be wrapped in eggcrate foam. No matter what area of your life needs a boost in comfort, eggcrate foam from The Foam Factory can help make things cozier, cushier and more comfortable. Can you custom cut an egg crate foam pad to be 27 inches long by 24 inches wide by 3.75 inches high? I need to replace the foam in my dog’s bed and it is an odd size, so I can not just buy a dog bed. Yes, we can custom cut the foam to your needs. Please contact us for details! We would suggeset a closed cell foam, like our neoprene foam for your application. need two pads “egg crate mattress 30″ x 40″ x 2-1/2″ thick” any color. Can you do this for me and the dog? Please send pricing per each plus shipping to 97222. We can do that for you. Please contact us for a price quote. Can you make an odd size egg create for a RV bed? Yes we can. Please contact us for more details and pricing. I need egg crate mattress 3/4 or double. Price please& location. Link to our eggcrate foam for bedding is here.